The principle of imposing protection over areas of the countryside that are threatened by change from manmade and natural influences are well established. The Wey Valley is subject to a good number of these at local, regional, national and European levels. However there are so many that it all can become just a tad confusing, so here we've attempted to outline the purpose of each. Much of the countryside in and around the Wey Valley is protected by a confusing array of designations many of which allow for prosecution if the byelaws are contravened. Here is a brief explanation of some of the conservation designations. A recognition of an area being of particular interest for its landscape and scenic beauty. This designation assigned by the Countryside Agency does not have any particular legal controls applied or central authority providing these powers. A good example of a successful AONB in the Wey Valley is that of the Surrey Hills which links together a chain of upland landscapes covering the North Downs that rise near Guildford as the Hog’s Back and stretches away to the Kent border. AONBs often incorporate other conservation designations. An area assigned as a Nature Reserve is protected by specific controls assigned by local government and are places with particular geological and wildlife features of interest locally. There are more than 600 LNRs in England. Established to protect sites of national interest especially in relation to the wildlife living there. There are over 200 NNRs in England with English Nature or Wildlife Trusts empowered to manage them. Established by the International Convention on Wetlands of International Importance in Ramsar in Iran in 1971, Ramsar sites focus particularly on waterfowl habitats along the coast, rivers and estuaries. There are 64 such sites in England which identify sensitive habits to local government in their planning controls. Particularly focused on geological and geomorphological sites deemed to be of particular importance regionally and that are not protected by statutorily protected an SSSI. RIGS provide an awareness to regional and local government planning departments and encourage conservation in cooperation with landowners. The lowest tier of conservation designation the SNCI is restricted to planning protection limited to protecting against developments of certain types and does not provide any protection for habitats and wildlife species. 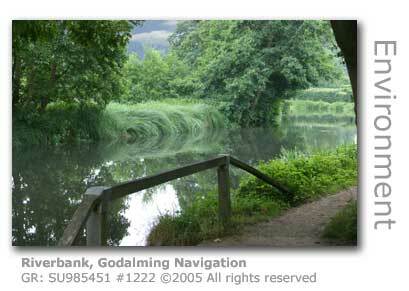 Farnham Park, Lammas Lands, and Westbrook in Elstead are examples in the Wey Valley. Effectively providing protection for the Wey Valley’s best sites for wildlife and geology and that play an important part locally. English Nature has responsibility for identifying and protecting SSSIs, but due to limited funds new SSSIs tend to be those sites under threat leaving other sensitive sites currently unprotected. Charterhouse (Godalming) to Eashing; Moor Park (Farnham); Thursley, Hankley and Frensham Commons; the Wey Valley Meadows across three sites; Papercourt; and Ockham & Wisley Commons are examples of SSSIs in the valley. Triggered by a Directive in 1992 by the European Commission, SACs are a European wide network of sites highlighted to protect habitats and species. 141 SACs have been proposed for England including the Thursley, Hankley and Frensham Commons in the Wey Valley. Another Directive from Europe, this issued by the European Commission in 1979 with specific focus on the conservation of habitats for wild birds. There are 73 SPAs in England with Thursley, Hankley and Frensham Commons again being among them.